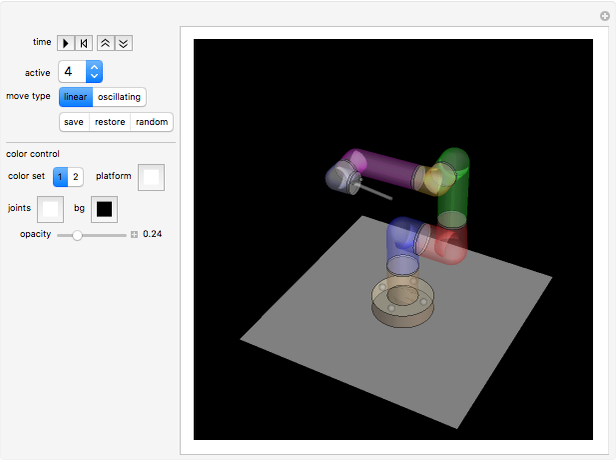 This Demonstration simulates the operation of a robot arm modeled after a real industrial machine. There are nine degrees of freedom: lifting the arm, seven 3D rotations and one gripper. The model applies the equations of forward kinematics to represent the results of manipulating seven rotational angles. "move type" Select "linear" to trigger nonstop rotations, which always go in the same direction, or "oscillating," with maximum rotations of 360°. 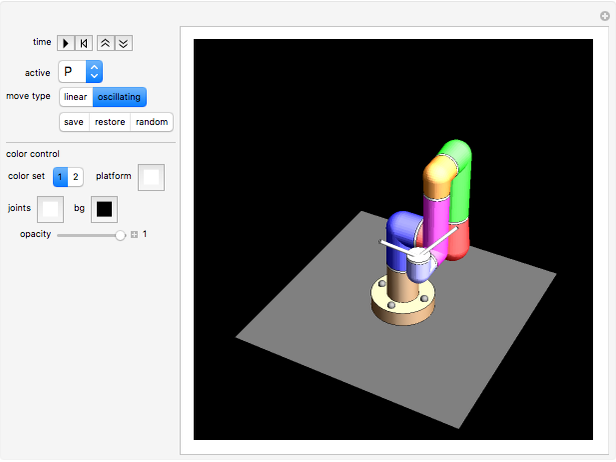 "save" Click the "save" button to store the current arm configuration. "restore" Click the "restore" button to restore the saved arm configuration. "random" Let the system select a random position of the robot arm. "color set" Choose one of two given sets of colors for the parts of the arms. "platform" Set the color of the square platform the robot arm stands on. The platform is semi-transparent. "joints" Set the color of the joints. "bg" Set the background color. "opacity" Move the opacity slider to make the structure transparent. Limitations This model does not check for intersection with itself. All rotations run at the same speed. Security for Humans When a robot arm has to work side by side with humans, safety is paramount, so a real robot arm might have sensors such as "elbow patches" on each part that might make contact with humans or other machines. These patches are not displayed here. Technical Notes The program code used is extremely simple and hence can be easily modified to describe the control of similar robot arms via rotations of joints. In this Demonstration, you can vary the height of the brown pedestal, but in reality the height of this pedestal is usually fixed and the pedestal is firmly bolted to the ground. 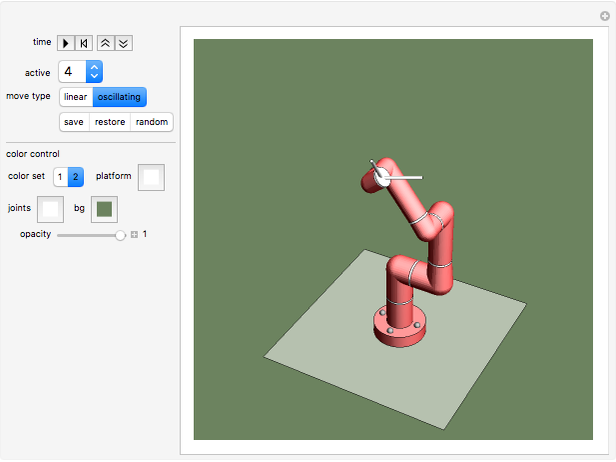 Karl Scherer "Animated Model of an Industrial Robot Arm"